Sand tray therapy is a technique of play therapy using sand, water, and a variety of miniatures and toys to build scenes or create stories within a tray filled with sand. Sand tray therapy is a safe and non-threatening way to build self esteem, manage feelings, and improve communication for children, teens and adults. Since it is fun and playful, participants learn and internalize coping strategies while they play. At GroundWork Counseling, sand tray therapy provides a method of communication and discovery that is beneficial to those children that do not respond to more traditional forms of therapy, or for young children who process best by play-based approaches. Since the brain processes images first and then attaches language to it, sand tray therapy is able to work around the defenses people may put up in the more cognitive part of the brain. This sand tray method of therapy serves as an effective and powerful outlet for children and offers an insightful method of gaining access to their challenging experiences, in order to move toward and heal. By creating this story in the sand, the child is able to release emotions, feelings, and conflicts that are affecting them without having to verbalize. The sand tray provides a safe and fun environment to bring about self-awareness, insights, and solutions. At Groundwork Counseling, our Child Counselors specialize in helping children find solutions to their struggles, fears and concerns utilizing play therapy, sand tray therapy, and cognitive behavioral interventions. Whether your child is exhibiting negative behaviors at home or school, having difficulty coping with a divorce, or experiencing anxiety or depression, at GroundWork Counseling we’re here to help. At GroundWork Counseling in Orlando Florida, sand tray therapy helps children, teens and adults express feelings that are difficult to put into words and enables them to work through conflicts and concerns non-verbally. 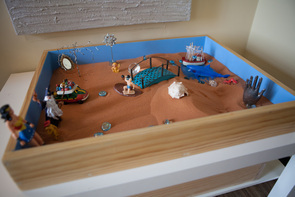 Using a tray of sand, water and miniature figurines and toys, clients create three-dimensional scenes in the sand as the therapist guides the process in exploring, understanding and gaining meaning from the sand tray. If one asks a child to describe their problem, or why they display a specific behavior, most likely the child will be unable to answer because children do not possess the words or understanding to verbalize an answer. When given a sand tray, children can unconsciously process their problems and behaviors. Children are immediately drawn to the sand tray and miniature figures, and the cool sand in their hands provides a calming effect. Many adults can also relate to playing in the sand during childhood. The act of building the world, scenes, or stories facilitates the process of healing and encourages growth. In the GroundWork Counseling office located in Maitland, Florida, dozens of miniature figures, toys and natural found items are arranged on open shelves in the bright and cheery play room, including animals, vehicles, buildings, trees, vegetation, human figures, religious icons and cosmic articles. Children are free to explore the variety of figurines and toys on the shelves and are encouraged to position and reposition the miniatures in the sand, using the sand to sculpt and mold as part of their sand tray therapy. At the end of a session, the child leaves with an intact image of the scene created, while the sand tray therapist photographs the scene to provide the developmental history of the sand tray process and digital images of the sand creations to be studied and discussed. Sand tray therapy is a safe and non-threatening way to build self esteem, manage feelings, and improve communication for children, teens and adults. Since it is fun and playful, participants learn and internalize coping strategies while they play. During sand tray therapy, the therapist becomes a silent observer watching the creation and listening to the creator’s story and acts as a facilitator to guide the process. Most people, especially children, enjoy sand play, as they can create and tell their own stories in a supportive and secure environment. With assistance by the sand tray therapist, a child can begin to recognize the relationship between the creation in the sand and their own inner world. 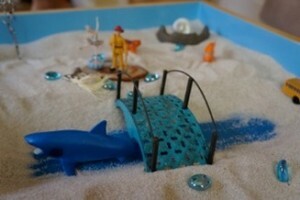 Sand tray therapy facilitates a deeper exploration of self. Many children are unable to vocalize their emotional state as a result of trauma, or because of their age and limited verbal skills. Often children will remain silent because they do not have the verbal ability to voice their feelings or struggles. Utilizing the familiar medium of the sand allows a child to instantly relax and achieve a sense of comfort and security to help the child verbalize internal feelings.